CALL 215-672-7500 Set Up Yours! SCHEDULE POLICY: Precise dates, field locations and game times are usually made available shortly before tournaments are scheduled to begin. As soon as schedules become available we will update our site at www.aabastars.com. Select your team under the Elite Teams Tab. The Academy is not responsible for technical difficulties involving the technology used to do this. The only constant in tournament baseball is change. This schedule is always subject to changes due to factors "beyond our control" such as the weather or any decisions, revisions or errors made by tournament organizers. The Academy will work diligently to honor the number of tournaments/games that are originally offered within the date range of the above season. To that end, we may add or lose games or tournaments. Changes will be conveyed immediately so that plans can be altered accordingly. If you have questions please contact our staff. Players and parents are asked to refrain from direct contact with tournament organizers and/or personnel. 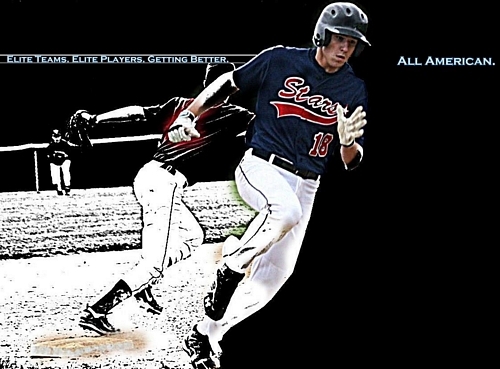 All American Baseball Academy strives to provide excellent communication for our players and families. All American Baseball Academy has a representative designated for administrative contact. THE FOLLOWING SECTION EXPLAINS THE POLICIES AND PROCEDURES REGARDING ROSTER SPOTS FOR ALL AMERICAN BASEBALL ACADEMY TEAMS. THE ACCEPTANCE OF A ROSTER SPOT IS A SERIOUS COMMITMENT. PLEASE READ AND UNDERSTAND. IF YOU ARE SELECTED BY THE ACADEMY STAFF YOU WILL BE OFFERED A ROSTER SPOT ON AN AABA STARS TEAM. A ROSTER SPOT IS A LIMITED OPPORTUNITY TO TRAIN AND DEVELOP YOUR SKILLS WITH OUR STAFF AS WELL AS THE OPPORTUNITY TO PLAY ON A STARS TEAM. A GREAT AMOUNT OF ADMINISTRATIVE WORK AND EXPENSES ARE INVOLVED BEFORE THE FIRST GAME IS EVEN PLAYED. FOR THESE REASONS AN INITIAL $500.00 NON-REFUNDABLE SECURITY DEPOSIT WILL BE REQUIRED TO SECURE A ROSTER SPOT AND THE COMMITMENT IS FOR THE ENTIRE SEASON. YOUR VERBAL APPROVAL, WRI9TTEN APPROVAL OR YOUR PAYMENT IS YOUR IMPLIED INTENT AND FULL ACCEPTANCE OF THESE TERMS. ANY AND ALL FUNDS IN YOUR ACADEMY ACCOUNT OR PAYMENTS THEREAFTER WILL BE APPLIED TO ALL TOTAL OUTSTANDING BALANCES WHICH MUST BE PAID IN FULL BY THE ASSIGNED DEADLINES PRIOR TO THE START OF THE SEASON AND UPON FULL PAYMENT THE ROSTER SPOT IS FULLY SECURED AND THERE ARE "NO REFUNDS". Our goal is to exceed your expectations and that is why it is important for you to understand how we form our teams and the policies we employ to please as many people as possible. These policies are in no way limited to this document. If you have any questions please call us. Everyone wants to play as much as possible, so we try to form teams with just the right amount of players. If we roster too many players then people complain that there are too many players and they are not getting enough playing time. If we roster to few players we are always at the risk of playing in a tournament and running out of pitching or catching. What happens if a player or two are injured or if they have to attend their sister's wedding or a family function. As you can see this is a daunting task and the Academy has no control over the events that occur in each of our player's or families' lives. The Academy is a business and we must factor in all of our costs and overhead to assure that our expenses are covered and that our professional coaching staff is paid. When you accept an offer to play for an Academy team you are accepting a "roster spot". A roster spot is a limited opportunity for a season. If you cannot attend any of the Academy events, for any reason, you sacrifice that opportunity and it is not refundable. The administrative responsibilities required to run each team starts many months prior to each season. The limited number of roster spots are determined ahead of time to guarantee that we can meet our obligations. The acceptance of the roster spot is with your understanding that you are agreeing to these terms. Replacing players who cannot participate is extremely difficult especially when it has to be done in a limited amount of time. In most cases the Academy cannot recover the extra expense and time lost to a player's inability to participate. We understand that injuries can and do happen and players are sometimes sidelined, however participation in sports comes with no guarantees and that is why every player and parent must sign a liability waiver. Injuries sometimes occur in the heat of competition. Injuries might occur while playing for school teams. They might occur outside of athletic activities. The bottom line is that a roster spot is a reserved opportunity for each player and whether you use it or not, all expenses for that spot are non-refundable. Good sportsmanship is the hallmark of the Academy. We expect all players and parents to have respect for the game and respect for each other. Our organization is invited to participate in exclusive events year after year because we have an excellent reputation for respecting the game and the teams we play regardless of some of the actions by others. Over the years we have heard thousands of complaints from players and parents regarding some of the bad behavior they have experienced in their local recreational leagues and it will not be tolerated here. This is an environment where players come to learn from their failures in order to be the best they can be. Bad behavior is simply the result of poor coaching. That coaching applies to players and parents. The price you pay to participate in this unique program affords you the opportunity to participate and take advantage of all the resources we provide. "Every player is expected to be on time and do the right thing." Parents are expected to be 100% supportive of "all" players regardless of wins or losses. At no time is it permissible for a parent to criticize any of the players on the team. Our staff will handle any problems on their own terms and at the appropriate time. If we receive any complaints regarding any player or parent who cannot control his comments or behavior we have the express authority to terminate that player from the program. If a tournament is rained out or cancelled, for any reason, the academy will make an effort to try to reschedule additional events, however it is very difficult to find last minute opportunities as most events fill months in advance and players and parents usually make other plans on open dates. That alone might prevent any alternate options. The only constant in tournament baseball is change. This schedule is subject to changes due to factors beyond our control. Decisions and revisions made by tournament directors may alter this schedule. The Academy will work diligently to honor the number of tournaments/games that are originally being offered within the date range of the above season. To that end, we may add or lose a tournament. Changes will be conveyed immediately so plans can be altered accordingly.